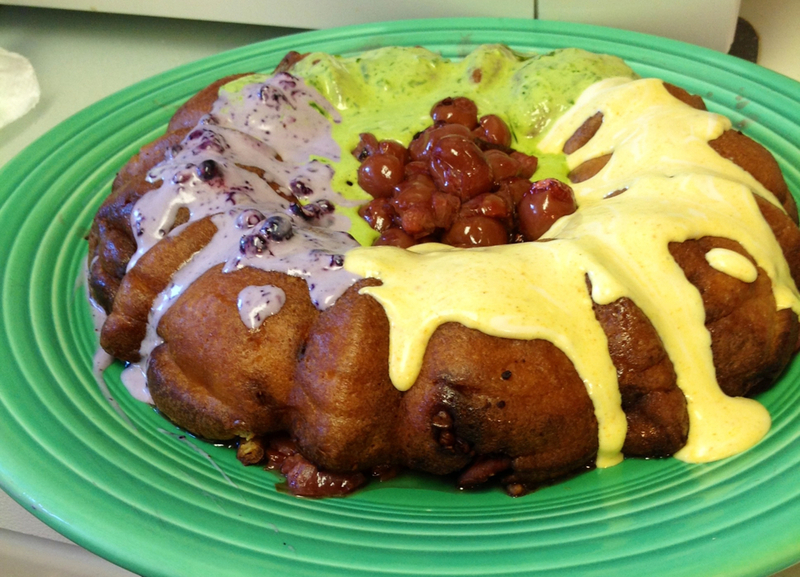 I have lived in Southern Louisiana for a little over 9 years, and I have had some delicious King Cakes. King Cakes are a traditional cinnamon roll-like “cake” made before or around Mardi Gras (Fat Tuesday, the date differs but usually mid to late February) and usually you can’t find them after St. Patrick’s Day. For more history, check out this link. 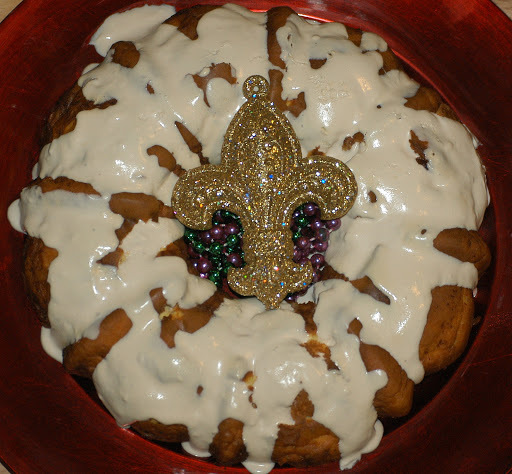 I thought I was taking a break from creating recipes since my Cookbook was published, but I was challenged this year by a few people, one being my friend from untilthethinladysings.com to create a grain and sugar-free King Cake. She also is surrounded by these tempting cakes. I accepted the challenge! So, here is my version. The batter is the secret part. I used a basic pop-over batter. I had never heard of popovers until making them in a nutrition class in college. The batter is simple: eggs, flour, milk and sometimes butter. I kept mine simple and didn’t add any butter but added vanilla and of course Stevia Select Stevia. The leavening comes from the hot pan (I used a pretty bundt pan) and the steam from the eggs and milk. Traditional popovers are made in popover pans or cupcake pans and they puff up pretty high and are hollow on the inside. I took advantage of that hollow part by baking in my favorite fillings. The fillings I chose were based off of an Apple Pie-Cheesecake-Pecan Pie I had created a few years ago. Such a great flavor combination! I am already envisioning spin off recipes such as Cinnamon “rolls” and even Sub-sandwich buns! 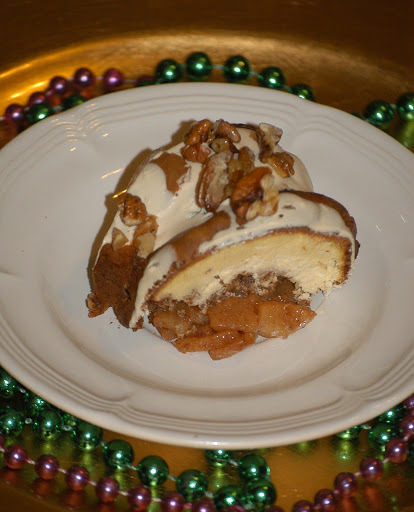 Apple, cream cheese & pecan filling. The key to this cake is a hot oven, preheated pan and not to open the oven door even to peak! This is the hard part. The recipe may look a bit grooling, but the individual parts are VERY easy. The batter is the easiest part of all. Toss all ingredients in blender and blend, voila! For those of you who have followed my blog and purchased my cookbook, you know that I use Stevia Select Stevia in all of my sweet recipes. I will also on occasion, use a minuscule amount of honey to get that extra sweetness without risking bitterness which could occur from using too much Stevia. I made 3 separate trial runs of the King Cake. One I used honey as my additional sweetener, one version I used coconut sugar and the last I used xylitol. The sweetness was all the same the key is which sweetener you prefer to use. The key is to taste every stage of the recipe so that the final result will be the correct sweetness for YOUR pallet! Again, taste your batter! I have also added the measurements for Virtue Sweetener. It is a great product that is 4 times as sweet as sugar so you only need 1/4 the amount that you would of a recipe that calls for sugar. I have added variations to recipe to make dairy free. I was quite surprised how good the dairy free version tasted. I made a mini one with unsweetened almond milk and one with coconut milk and really couldn’t tell the difference. Of course, omit the cheesecake filling and instead of the cream cheese based icing, a drizzle of raw honey is all that is needed. Preheat oven to 425 degrees F. Add butter (or coconut oil) to bundt pan and place in oven and allow to preheat. The butter will brown but this will not negatively affect the cake. The pan should preheat for at least 10 minutes but no more than 15 minutes. Prepare batter. Add eggs, milk, almond flour, stevia and vanilla to a blender or Magic Bullet and blend until smooth. Taste for sweetness and adjust if needed. Set aside. Prepare Cheesecake Filling. To a small bowl add pecans, cinnamon, sweetener and butter. Mix until pecans are well coated. Taste for sweetness and adjust if necessary. By now, the bundt pan should be preheated. Carefully remove bundt pan from hot oven. Using pastry brush or paper towel, be sure to get butter all over the sides of bunt pan (at least the lower half). Work quickly but carefully. Next pour in half of popover batter (eyeball amount). Then using tablespoon, spoon cheesecake mixture evenly over batter. Next, sprinkle pecan crumble over cheesecake mixture and finish with remaining batter. Bake at 425 degrees F for 20 minutes, being sure not to open oven door. After 20 minutes, turn off oven and leave in for an additional 5 minutes. Carefully remove cake from oven and allow to cool for 10 minutes in the pan. Cake will fall after the 10 minutes. This is normal. Before attempting to remove, use butter knife and go around all edges to make sure cake is loosened. Place plate on top of cake and invert. You may have to give it a good “knockin” for it to come out. **Note: I made 3 large cakes and 2 smaller ones when testing this recipe. The first big one came out beautifully, the second broke and the 3rd came out 99%. If any breakage occurs, it will be covered by icing so don’t panic too much! For cream cheese icing, blend cream cheese, milk, vanilla and sweetener in a medium bowl until smooth. Taste for sweetness and adjust if needed. Drizzle just a bit of raw honey over prepared King Cake along with chopped nuts. Take King Cake, which has been inverted onto a plate, and using another plate, invert it back to where the flat side of cake is up. Top with cooked apples and some of icing. Invert cake back to serving dish. The apples should be on bottom and cake on top. (If you like, you can serve the cake any way you like it, putting apples on top). Next, top with icing (or raw honey for dairy free) and additional pecans if desired. To get the colors of Mardi Gras without the colored sugar sprinkles which are traditionally used, fill center of cake with colored Mardi Gras beads. Want a baby, in your cake?? Get it HERE. Serve cold or room temperature. You could also purchase a plastic baby and insert it into cake before serving. **Dairy Free Version- Great warm or room temperature. Shea’s beautiful King Cake. To make Purple, she used blueberries, Yellow-turmeric, Green-spinach. 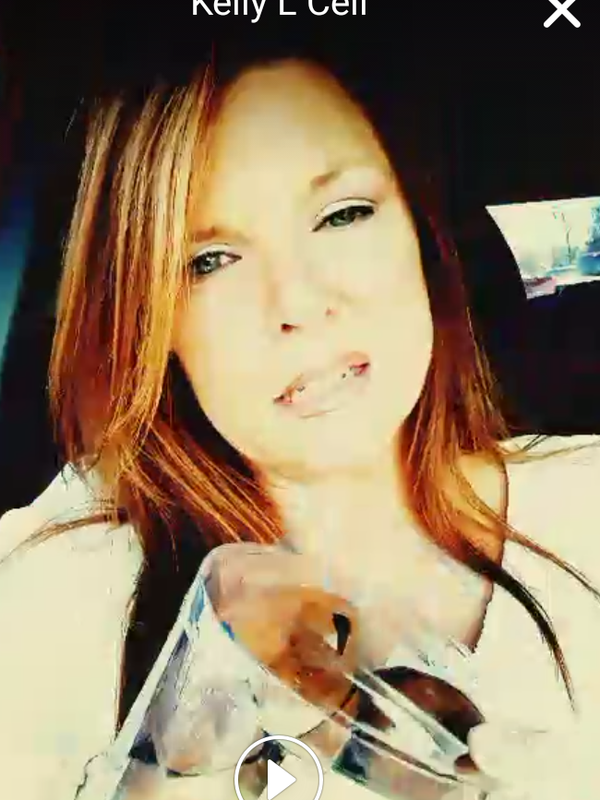 She just added it to the blender with the cream icing. Instead of apples, she used cherries! Make it your own! Summer’s King Cake Cupcakes over at The Dirty Floor Diaries! What a great idea for easy individual portions! This is Katja’s King Cake slice. @unknown, any sweetener will work. I used 3 different kinds and they all were fabulous. I would hesitate putting anything into the batter that will crystalize and cause the cake to stick to the pan. That is why I only used the Kal Pure Stevia in the "cake" itself. Hope this helps! Enjoy! @Rosemary, so glad I could make another happy girl! Keep me posted! Melissa, I know you from the "Paleo Lovers" Facebook page. I hail from Houston, where we love to enjoy these cakes too. I'll be making it! Looks so yummy!!! @heidi, let me know when you make it! Hope you enjoy it! @Heather, yes, you can substitute honey for stevia. Just taste each step of the process. Let me know how it turns out! I LOVE YOU!!!!!!!!!!!!!!!!!!! I was just telling all of Facebook land that I wanted King Cake but obviously can't eat it. She told me you had one so I looked, and holy Kings in Heaven! KING CAKE! And I have ALL of the ingredients! Girl, this is totally going on the website. @Summer,;-) So glad this makes you a happy gal! I hope you make the King Cake, it is delicious! Please feel free to share the link to the recipe and I would love to see the picture of your after you make it! I for one am THRILLED you use stevia. I grow SO tired of all the sugar full recipes (honey, maple etc. etc.) sugar is sugar and some of us can NOT have ANY sugar and really need these recipes for our health. Thanks SO much for not compromising your recipes. Its refreshing to find TRULY sugar free recipes. I hope you enjoy my sugar-free recipes! Melissa I am so grateful for you & all the research you have done to provide us with these wonderful recipes. You are truly a blessing to ALL of us. Thank you again for all your time & dedication..